Controversial England batting legend Geoff Boycott made a groveling apology on Tuesday for remarking he needed to "black up his face" to get a knighthood at an event last week. 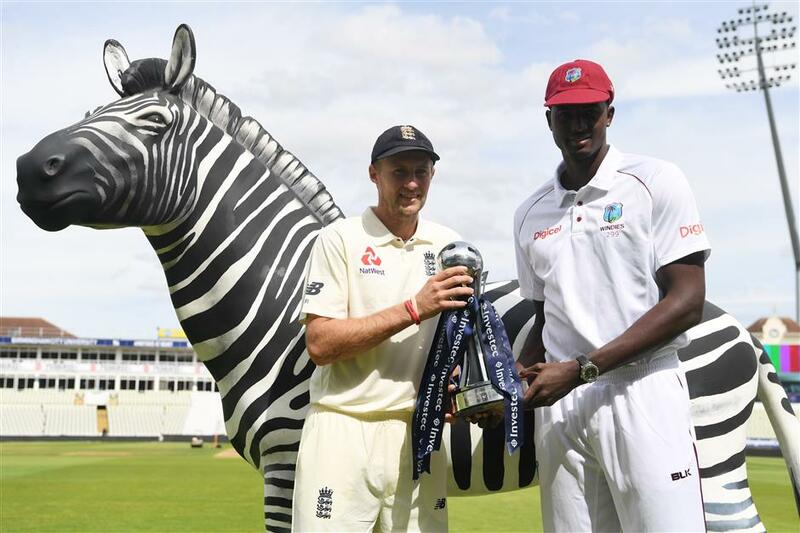 England caption Joe Root (left) and West Indies captain Jason Holder pose for a picture with the series trophy on the eve of their first test at Edgbaston in Birmingham, central England, on August 16, 2017. The 76-year-old astonished his audience with his comment during a question and answer session in one of the intervals at last week's first test with the West Indies. Boycott, who played a pivotal role in organizing the 1982 England rebel tour of South Africa when sporting links had been cut with the rest of the world because of the apartheid regime, said knighthoods had been bestowed on West Indian cricketers like "confetti". "Mine's been turned down twice. I'd better black me face," Boycott is reported to have said according to a guest at the event cited by The Daily Mirror. The guest at the event — which cost 300 pounds (US$385) to attend — said the remark though intended as a joke was "crass" and went down like a "lead balloon". However, Boycott — who has overcome throat cancer in 2002 to become a popular and outspoken pundit on BBC Radio's globally renowned Test Match Special — took to Twitter on Tuesday to unreservedly apologize. "Speaking at an informal gathering I was asked a question and I realize my answer was unacceptable," he tweeted. "I meant no offense but what I said was clearly wrong and I apologize unreservedly. "I have loved West Indian cricket my whole life and have the utmost respect for its players." West Indies greats like Viv Richards, Garfield Sobers and Curtly Ambrose have been knighted whilst the last England cricketer to be knighted was Ian Botham — no stranger to controversy himself — in 2007. Boycott has always contended the reason he has not been knighted is because of his conviction in France — firstly in 1996 and confirmed on appeal in 1998 — for assaulting former girlfriend Margaret Moore. A durable but unspectacular opening batsman, Boycott played 108 tests, scoring 8114 runs with 22 centuries at an average of 47.72.